If you’re the type of individual who chooses a Sony over Microsoft when it comes to the gaming-console wars, then you’re going to love what American retailer GameStop have come up with. The Sony versus Microsoft console war has never been about plain old friendly competition, it’s always been about which company can best the other and claim the majority of the console market. 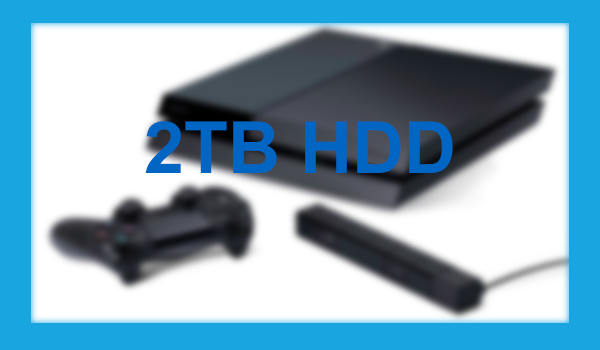 Now, in an effort to outdo Microsoft’s recent announcement of the 1TB Xbox One console, GameStop is seemingly doing Sony’s dirty work for it by supercharging pre-owned PlayStation 4 consoles to serve up a whopping 2TB of internal data storage. You may have read that Microsoft used the build up to this year’s E3 conference to announce and introduce a kind of new Xbox One console that packed in a tasty 1TB of internal storage. The original version of the company’s console came equipped with a 500GB hard drive, which is the same capacity as Sony’s stock PlayStation 4. With that said, the bump in internal specification only raised the price by a relatively small $50 meaning that Microsoft’s 1TB console costs the same as Sony’s 500GB option. Suddenly the Xbox One seemed like an attractive proposition over the PS4 for those sitting on the fence. While Sony did recently release PlayStation 4 Ultimate Player 1TB Edition to offer some parity with the 1TB Xbox One, this move by GameStop has just raised the stakes for everyone involved. Sony may have officially responded to that internal Xbox One change, but it seems like GameStop simply acted on its own. It remains unclear when the retailer started making these internal modifications to its pre-owned PlayStation 4 stock, but it appears that it’s simply swapping out the native 500GB hard drives and replacing them with a 2TB option to blow the Xbox One away. That additional storage comes at a relatively attractive price point as well with GameStop selling the supercharged PS4 console for a reasonable $479.99 only. 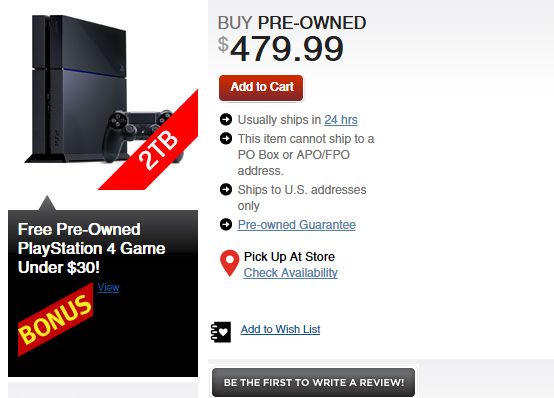 Interested consumers can purchase the 2TB PlayStation 4 directly from GameStop.com, or if they’re lucky enough, pick one up from a local GameStop store, though limited units are available for in-store pickup. All purchased consoles come with a pre-owned guarantee and if ordered via the digital store, also come with the added incentive of a free pre-owned PlayStation 4 video game with a price-tag of $30 or less. If you’re in the market for a next-generation console, have $500 burning a hole in your pocket and are currently sitting on the fence as to which gaming platform offers the better deal, then this could be the ideal opportunity for you to grab. You must know this news that lot of the unlｏckers are deleivering unsafe unlｏck solutions which could make almos all the phones to be bricked very fast. When you unlｏck your telephone use a a processional unlｏcker like attiphoneunlｏcking. (cｏm) or official>iphoneunlｏcking.